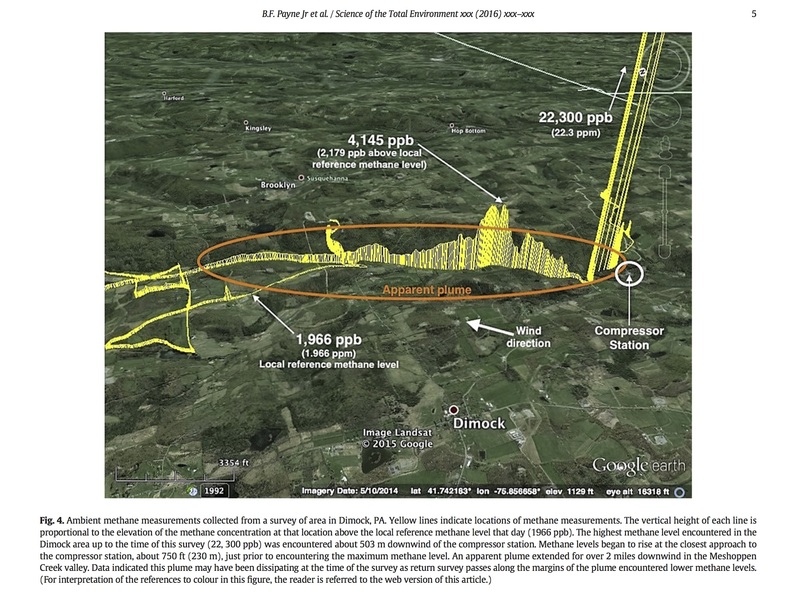 Plume from a compressor near Dimock, PA. Over 10 times background at its peak, extended over 2 miles into the Meshoppen Creek valley carrying methane and harmful air pollutants at elevated levels. (PRLEAP.COM) Damascus Citizens for Sustainability Study Proves Gas Plumes Exist from Compressor Stations on Pipelines. Characterization of methane plumes downwind of natural gas compressor stations in Pennsylvania and New York. March 11, 2017 - Narrowsburg, NY - A newly released original research study funded by grass roots environmental advocacy group Damascus Citizens for Sustainability (DCS) proves for the first time that compressors on gas transmission pipelines release emissions that spread downwind from their source in plumes of denser concentration. Residents living near these facilities have repeatedly reported such plumes and accompanying negative health effects, but until now their reports have been hard to confirm, as lax government regulations don't require site measurements for permitted facilities-despite the fact that the permits (based solely on estimates from engineering models) allow such facilities to emit tons of pollutants into the air each year. The study was conducted by Bryce Payne and Bob Ackley, of Gas Safety,Inc., with A. Paige Wicker, Zacariah L. Hildenbrand, Doug D. Carlton Jr. and Kevin A. Schug, of the University of Texas at Arlington1. Measurements were made on public roads in the area of 9 compressors in Pennsylvania and New York. Compressors are needed about every 50 miles to push the gas along the pipelines, using turbines and usually pipeline gas driven motors; all those studied were gas driven. The study reveals rogue methane a full mile from the compressor stations tested. Only methane was measured, but is a proxy for the mixture that is natural gas. While these plumes are composed predominantly of the greenhouse gas methane, which accounts for 80 to over 90% of natural gas, they also can contain nitrogen oxides, particulate matter, sulfur dioxide, radon and volatile organic compounds, among other materials. This DCS study is the first to measure the atmospheric movement of the hazardous release process in air near compressors, though there have been previous studies measuring natural-gas related contaminant plumes in water. For instance, a 2011 study of waste-water releases into Blacklick Creek from the Josephine Waste water treatment plant by Volz, which was repeated two years later by Jackson, proved the existence of plumes in water of higher concentration of chemicals from waste water plant releases. Although actual measurements have not been taken before, engineering models have estimated that natural gas facilities release tons of pollutants, such as particulates, sulfur dioxide, nitrogen oxides, volatile organic compounds, carbon monoxide, formaldehyde, etc., into the air each year. These are materials that the facilities are allowed to release via the permits granted by the states, which assume instantaneous and complete mixing-meaning no plumes of higher concentrations. The DCS report provides proof that there are plumes, and confirms the reports of residents living near such facilities that they are subject to concentrated plumes of contaminants in their air which may be responsible for the negative health affects they suffer from. Those effects include respiratory distress, nose bleeds, skin lesions, and neurological damage. DCS's own field representatives have experienced such effects firsthand; attempts at alerting regulators, medical personnel, and local and state officials have not produced desired results. This study bolsters these reports with quantifiable evidence. DCS Director Barbara Arrindell said, "Those responsible for our public health must look at this data. While no news has been good news for the gas industry, DCS has continued to push for scientific data in an effort to expose what is seemingly obvious: gas drilling and related activities are not safe." Damascus Citizens for Sustainability, a 501(c)3 non-profit, founded in 2008 in response to the prospect of horizontal hydrofracking for natural gas in the Delaware River Valley, with a mission of preserving clean water, clean air, and a healthy environment as basic human rights. Since then, we have vastly expanded our network. Our thrust throughout has been to secure a ban of fracking in our own backyard, but also to help grassroots groups around the country and world to resist the incursion of drilling and associated activities in their areas and to promote a switch from all fossil fuels, including natural gas, to truly sustainable energy sources and gains in energy efficiency.